I want to share with my method of cleaning out and transporting all the stuff of life that lives in our purses. I don't need to tell you that if you carry a heavy purse, you are hurting your shoulders and your back and this damage can be long term. But what exactly is the solution? Let's think about what men do. They carry just what they need, in their pockets, and then they have a brief case, satchel or backpack for the rest, that stays in the car most of the time. This system is based on the idea that we really don't need to carry everything with us all the time. more junk here. Then remove anything you absolutely do not need to be carrying around, ie trash, etc. Glasses, Money, Credit cards/ID car keys chapstick and phone. 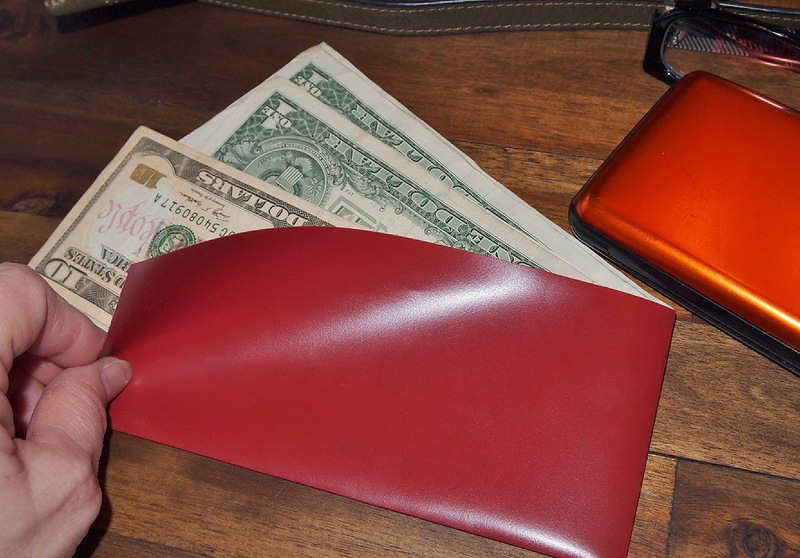 I took a plastic file folder, cut it to just a bit larger than my bills and they tuck nicely inside. 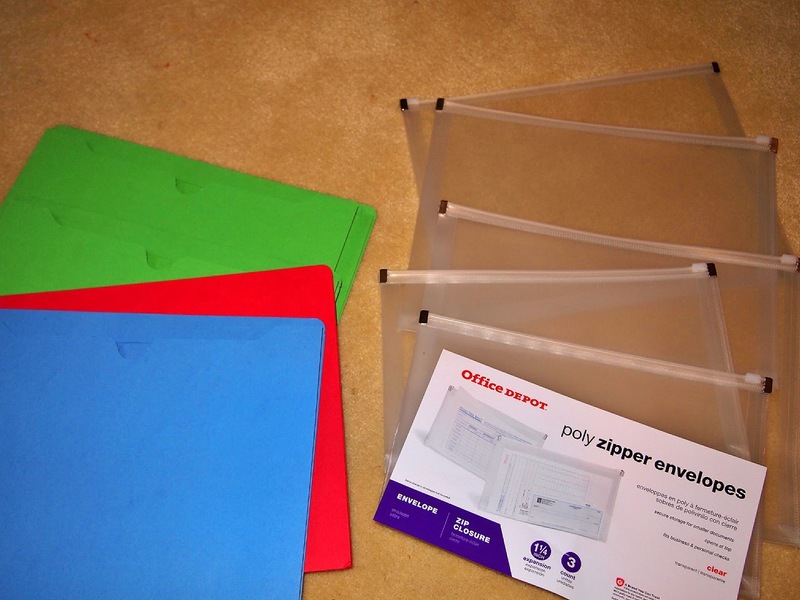 These folders have one size fuzed, so it's closed on two sides,and open on two sides. I love this and it is much smaller than a wallet. For my cards, I have a snap close card case, when opened they are all easily visible and easy to get to. 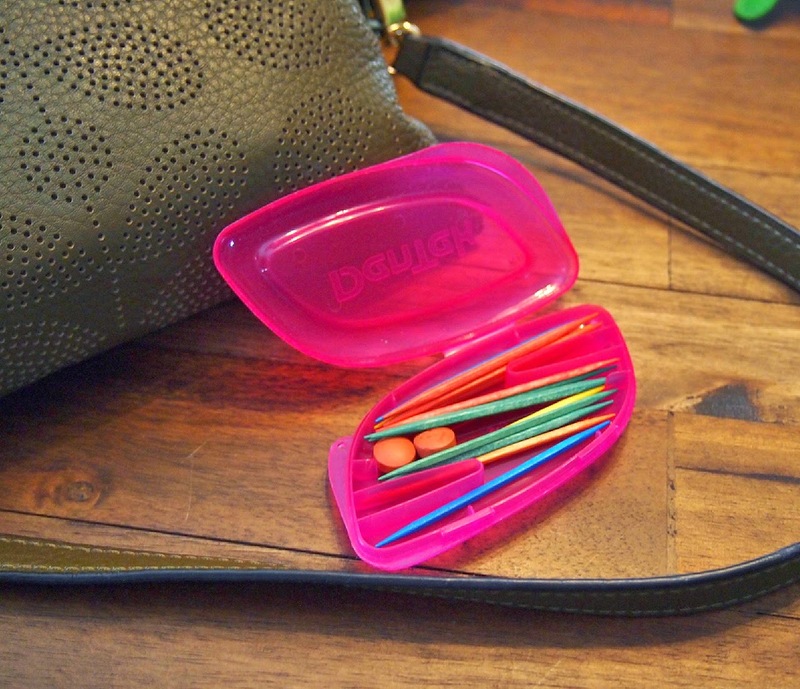 I purchased some of those dental tooth picks with the floss attached just for this thin case. Inside I keep a few tooth picks and a couple of Ibuprofen. My car key, chapstick and lipstick are tucked into the two built in pockets. 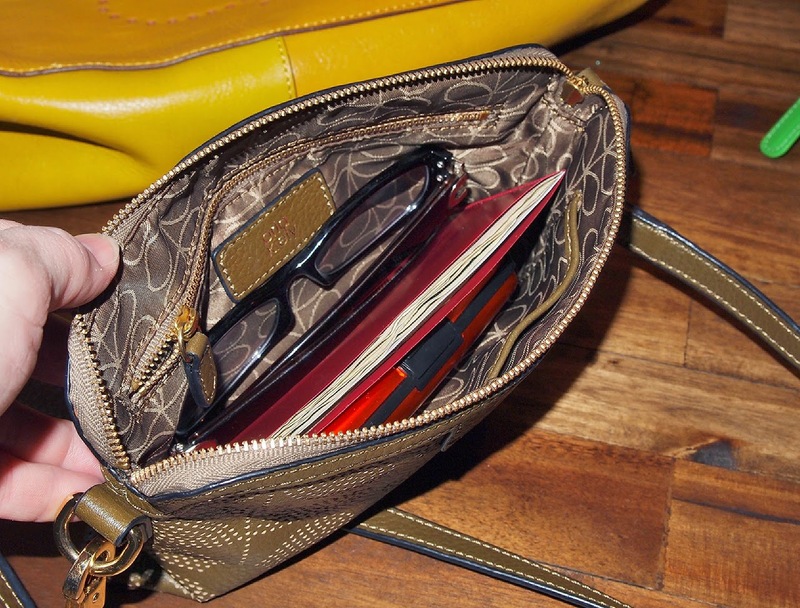 My phone can also fit nicely in here if needed, and there is enough room for my reading glasses. This bag weighs only 1 pound and has a long strap for wearing cross body which I love. Note: Because my car is keyless I never have to dig for this key, it just stays in place. If you don't have a keyless car, Put that on your wish list for your next car. I absolutely love this feature. Now for what goes in the big bag or what I call my Back and Forth Bag. This bag goes from home to car and work to car and that is it . I never carry it into the store, or restaurant for good reason. Once packed it weighs 3 pounds. 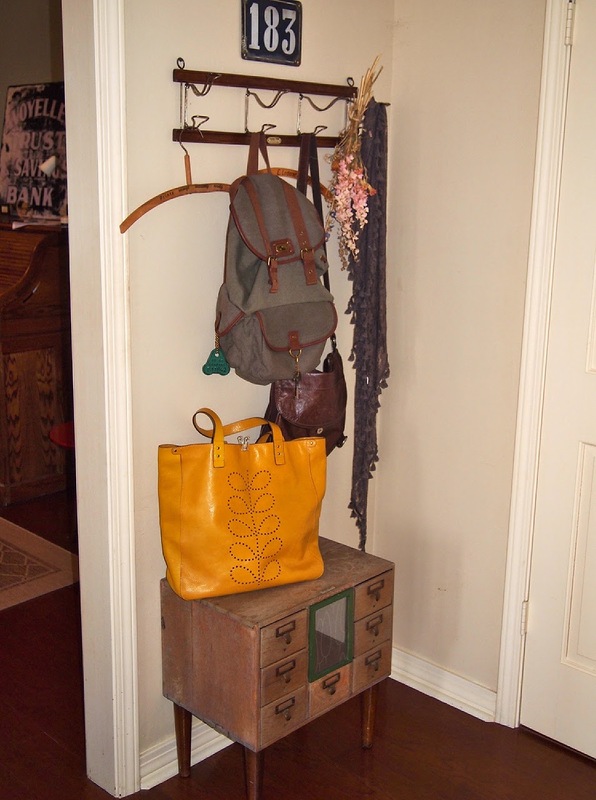 A ribbon can be pinned into any bag for this feature. 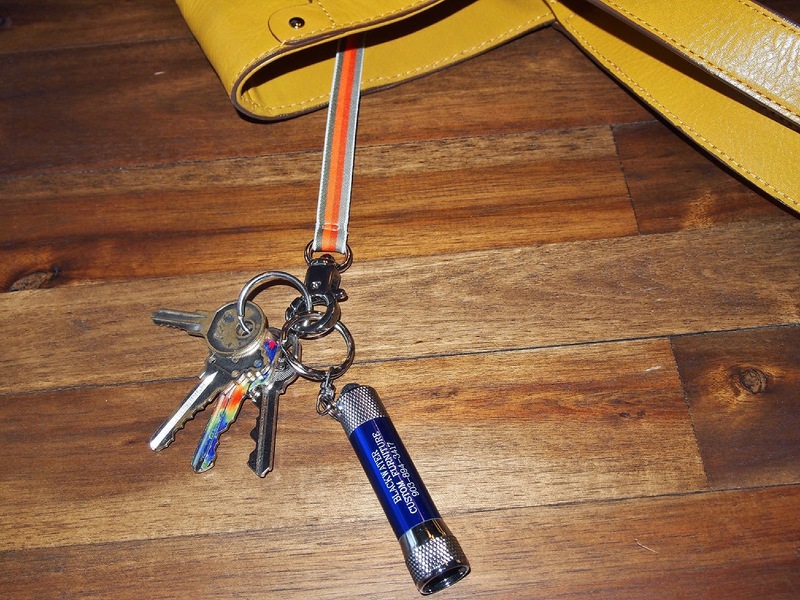 A small pin flashlight is hand too. A plastic folder. 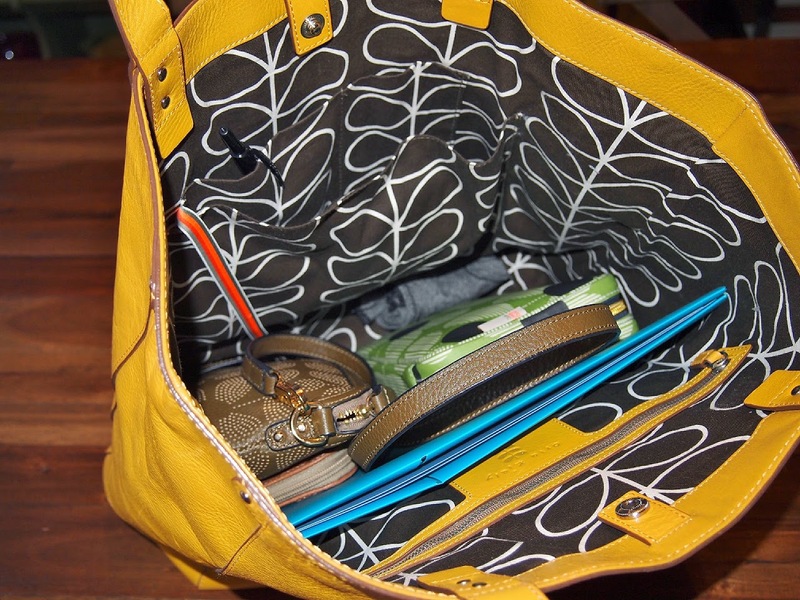 In here I put items that I need to take from home to work or from work to home. A Few coupons etc. It is emptied daily, I don't let things accumulate in there. 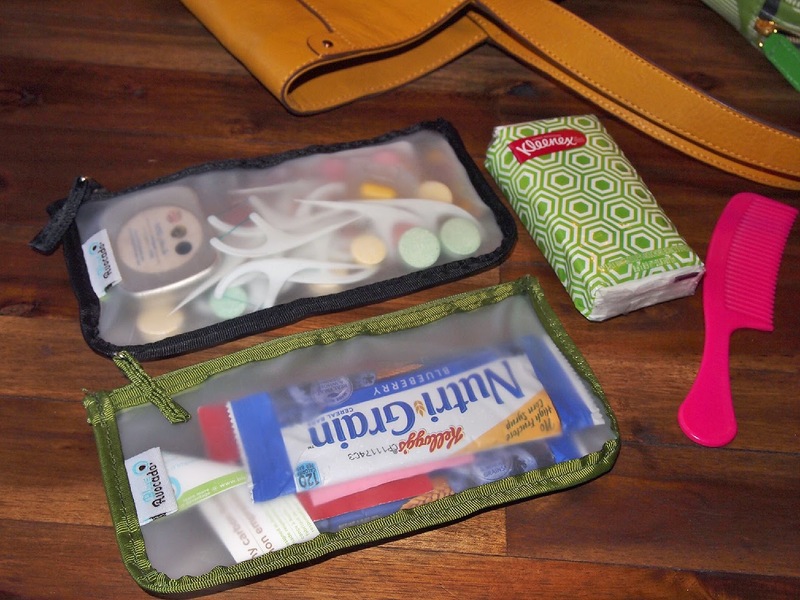 I love pouches, and I picked up these two clear ones at The Container Store. I can see what is inside easily. One holds emergency snacks and the other is for medicines etc. 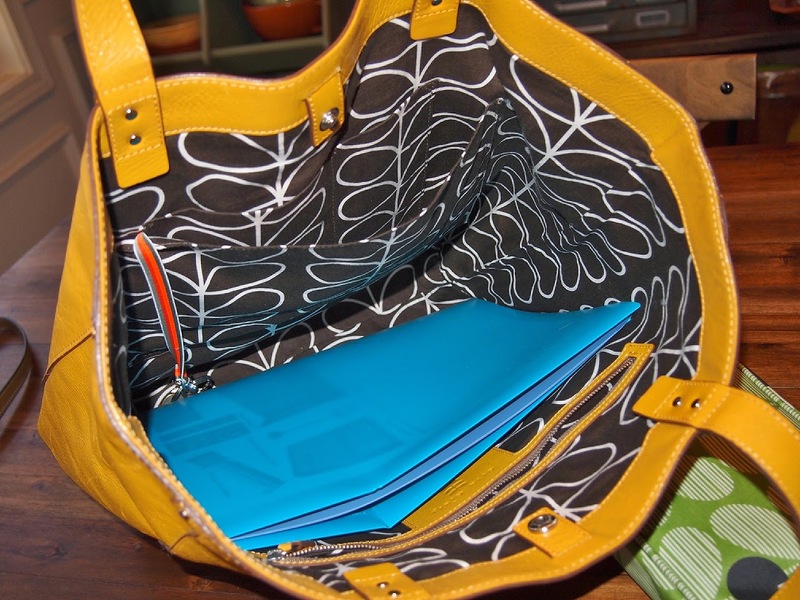 the pouches, and kleenex go in the large zipper pocket in the big bag. paper, pen and tape measure in here. All zipped up and easy to get to. In the open pockets I have a pen, comb, lipstick and gum. 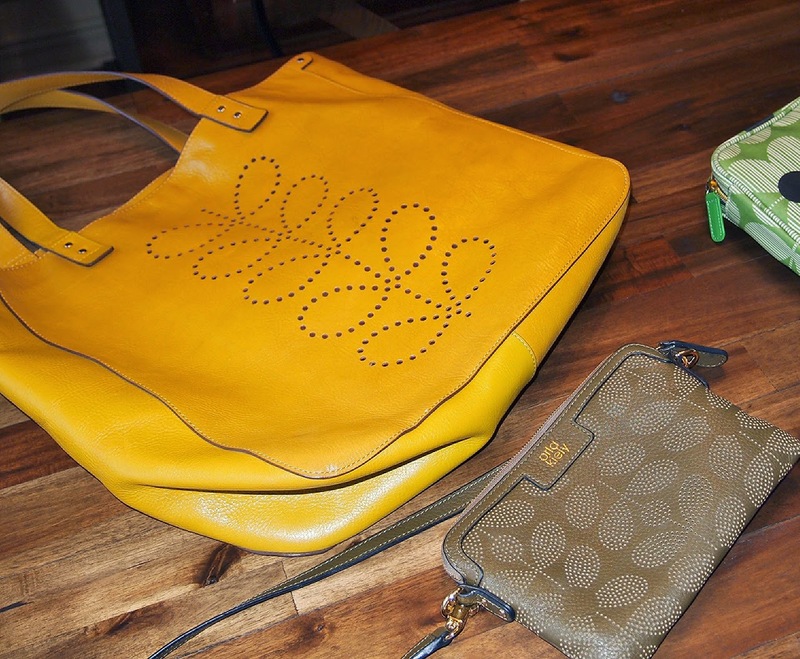 The small purse fits nicely inside and I'm ready to grab and go. 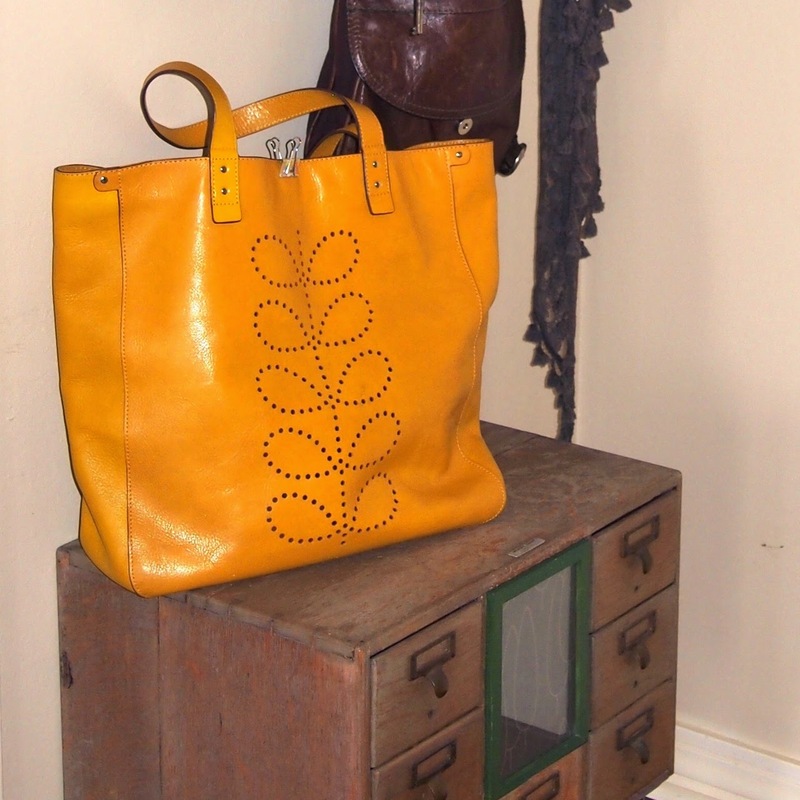 As you can see I love Orla Kiely bags, but any bag will do. 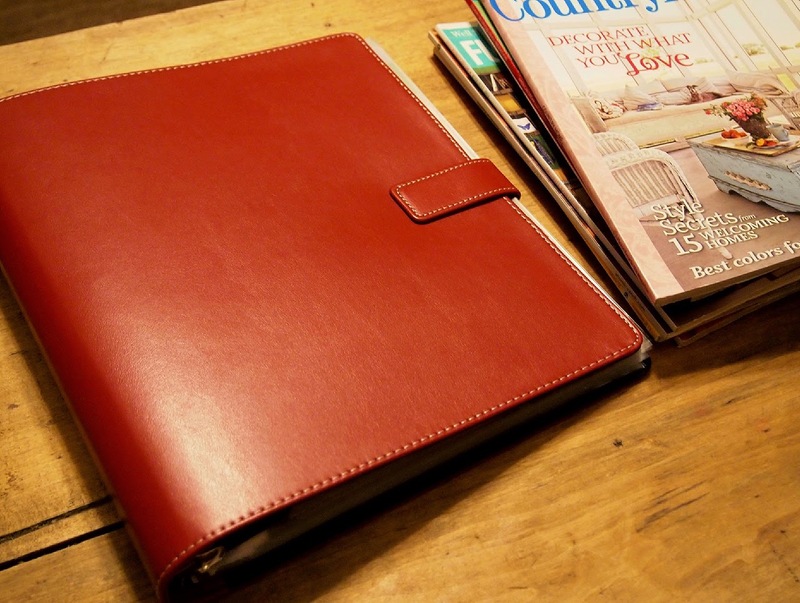 Just make sure it's as wide as a file folder and large enough to carry any planner or other items you need handy. But remember, those things stay in the back and forth bag. I like the cross body pouch better than a wallet for a couple of reasons. 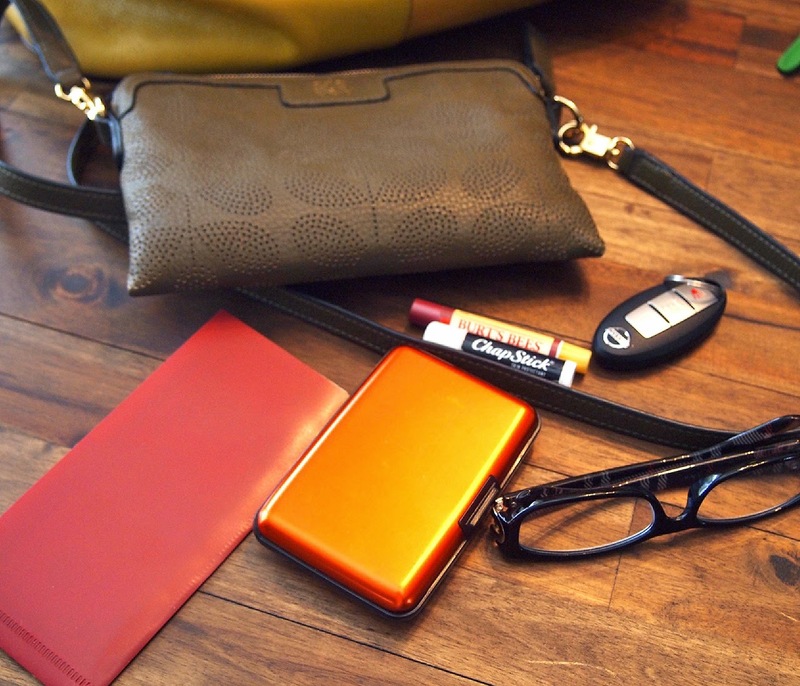 1) I've actually laid a wallet down or dropped it and lost it in the past, I can't do that with a cross body bag. 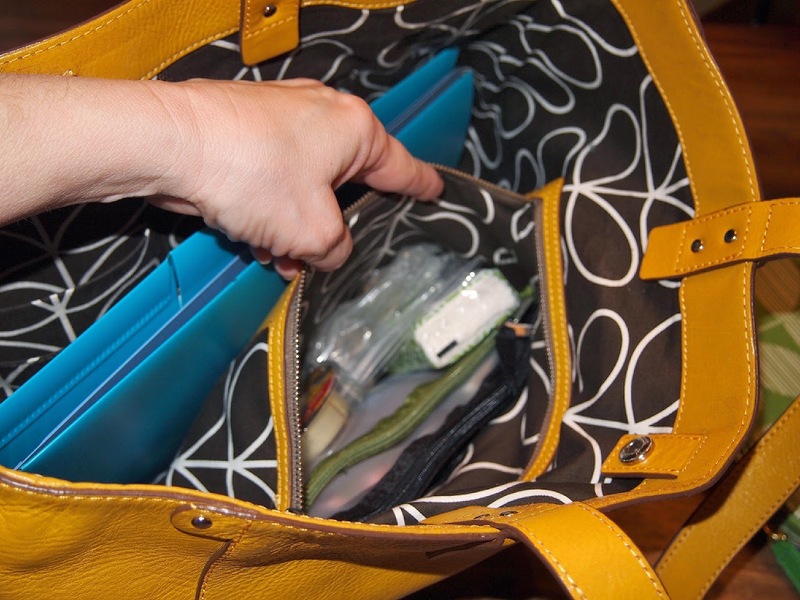 2) If a wallet is in my hands or on my wrist my hands are not free to browse and a cross body bag is not in my way. Adjust this system to fit your own way of doing things. Your back and shoulders will thank you. I'm like you, I love magazines, and I've kept them and they have accumulated over the years. But the truth is I only browsed through them rarely. In an effort to truly de-clutter my house I decided to tackle this problem. 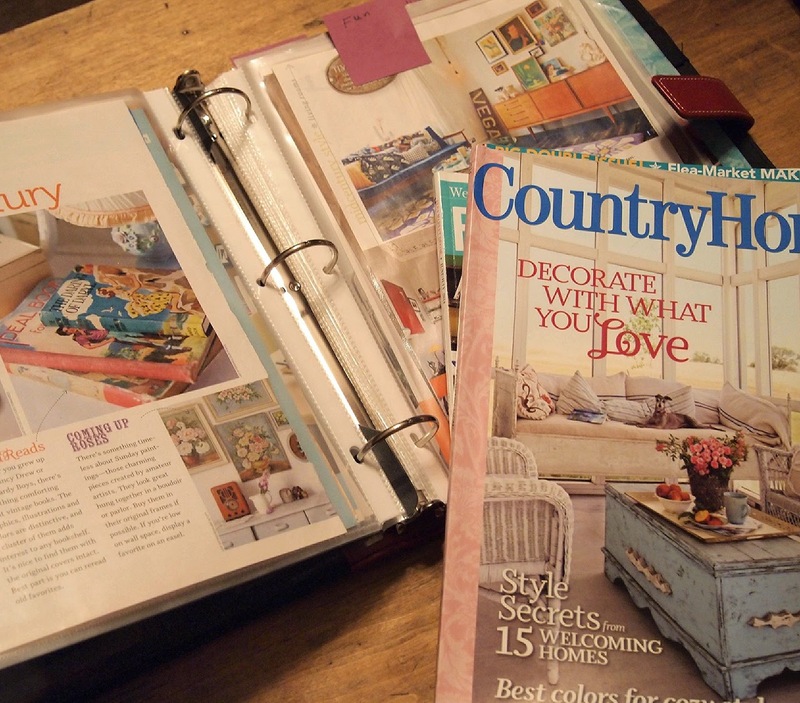 This small stack of Country Home is only about 1/5 of the quantity of magazines I had accumulated. 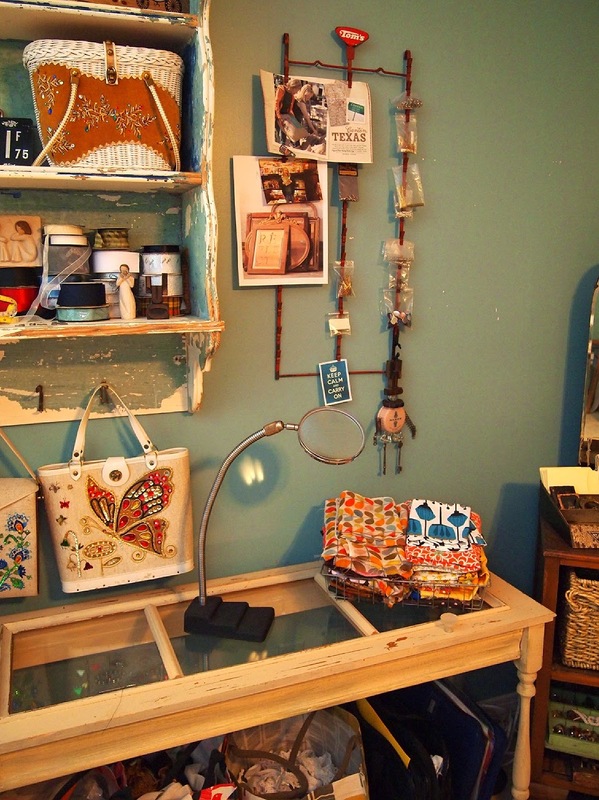 The plan was to slowly browse through each and every one, pulling out the articles and photos I wanted to keep. This is a good project for TV couch time. Once a magazine was thoroughly flipped through, I did what is so hard. Now for the ugly truth. because these go back so far, some as far as the 90's, most of them were not all that interesting. Maybe it's because I'd thumbed through them so often, but I did not find them all that inspiring. What I liked, I kept and discarded the rest. 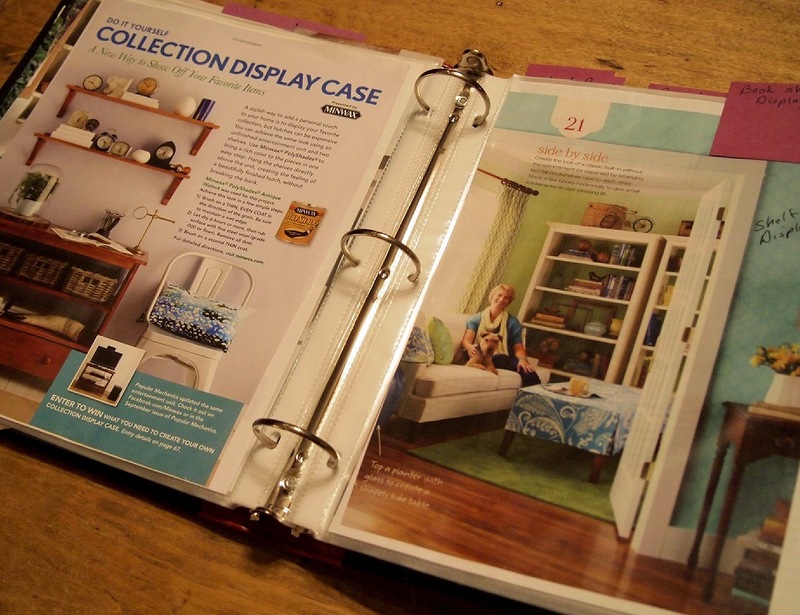 Then I separated them into categories and placed the photos and articles in sheet protectors. 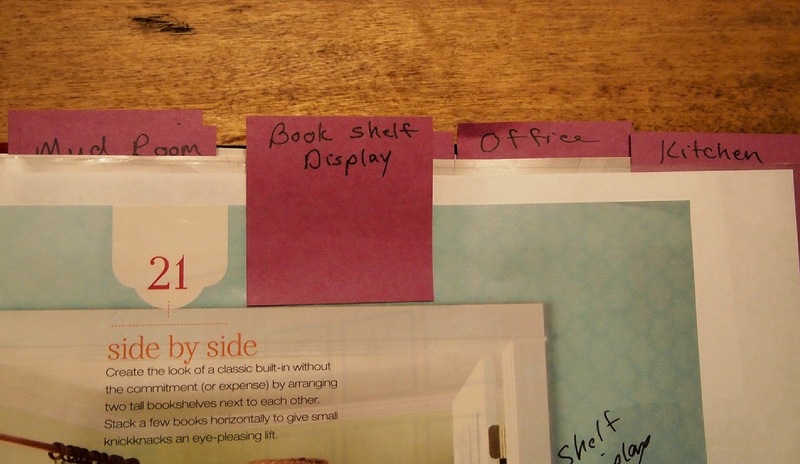 I added simple tabs made from post it notes to separate the sections. It's also easy to remove and replace them as I find new projects. Think of it like a pinterest board, but in a book. And I cleared out a bunch of bookshelf space too!!!! If you follow my blog and Facebook then you know I am doing a whole house purge this year. This past weekend I tackled my keepsake / memory closet. Below is a before shot. 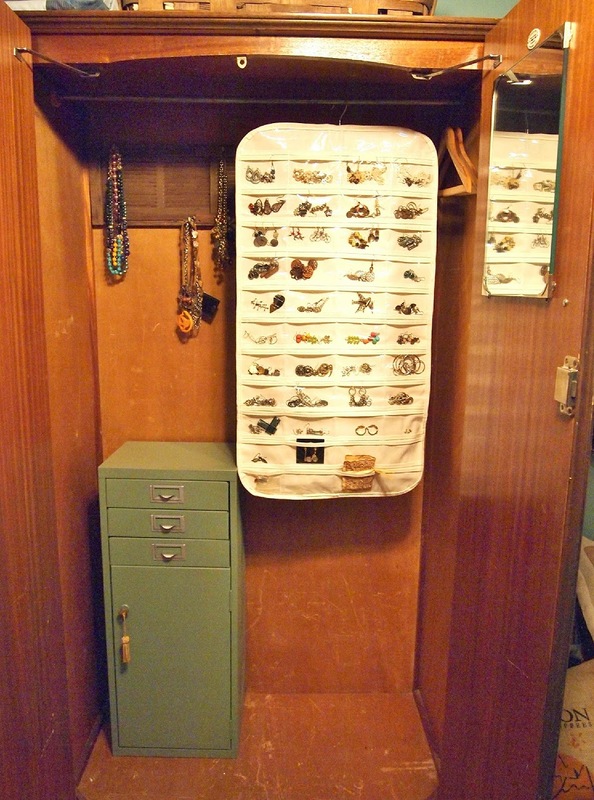 This closet had accumulated a number of things in the past 10 years. Luggage, keepsakes, random clothing etc. 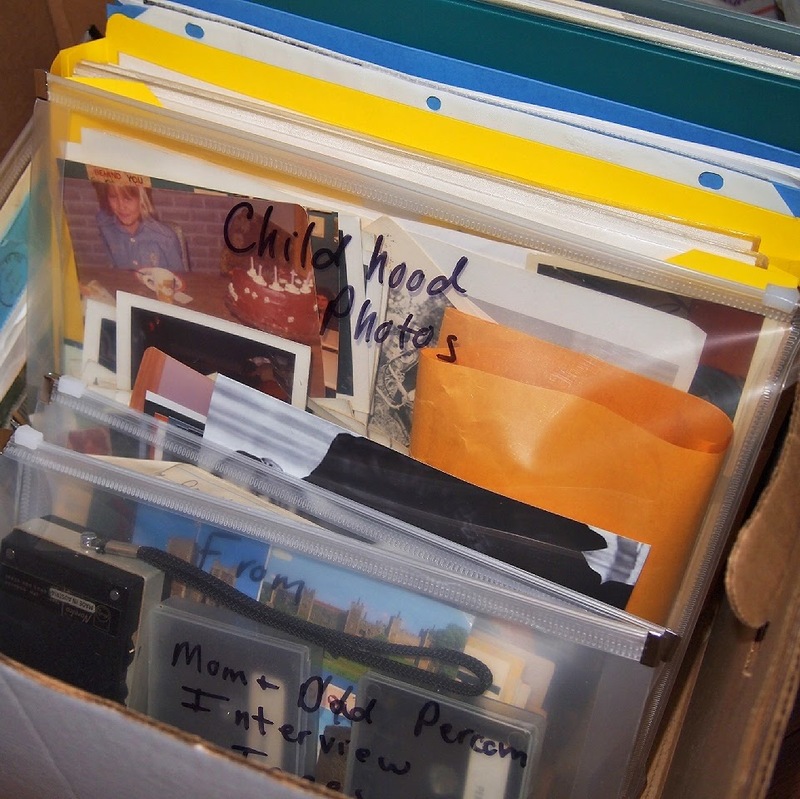 And although my photos are already somewhat organized in scrapbooks (not shown). The extras and duplicates are in these labeled shoe sized boxes from the craft store, So I had a head start. What I needed to do was organize the last 10 years of photos and memorabilia that had just been thrown in this closet to (get to some day). And below we have the After. 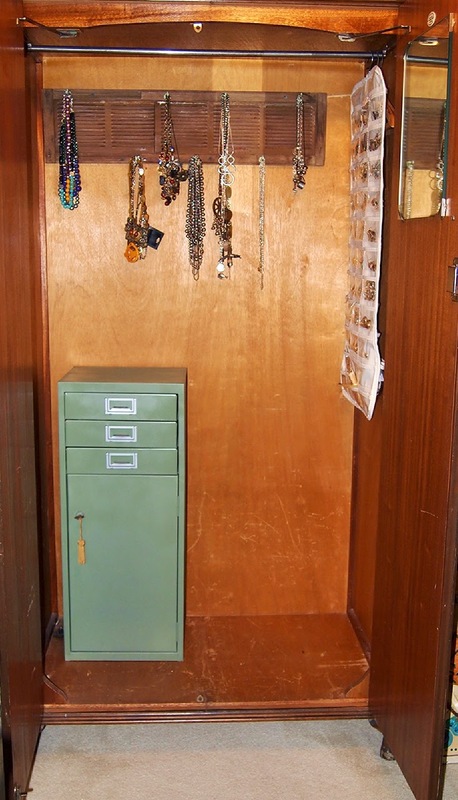 The first thing I did was to designate this a Memory closet only. So the luggage went down the hall to another more appropriate closet. 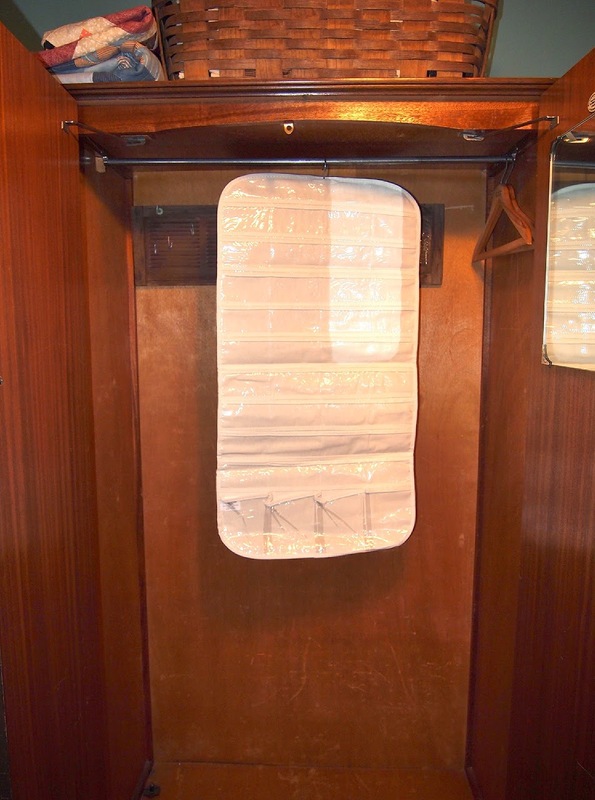 I hung my wedding dress, and a few other pieces of important clothing in this closet. That is the only clothing in here. I realized that I could fit more of the shoe boxes on the second shelf than the top shelf due to the slope of the roof so I moved them. 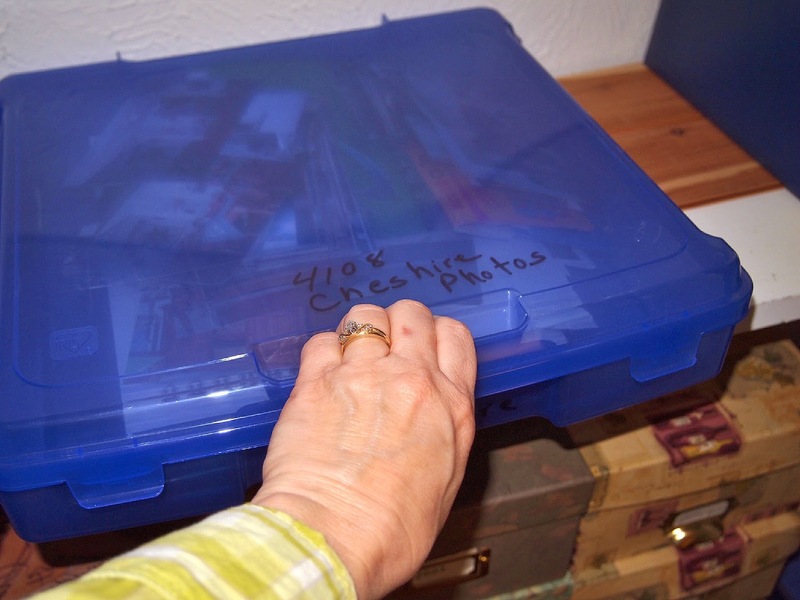 My kids memory boxes were reduced and divide by items that had to be stored inside, and items that could be moved to the attic. In other words, no photos in the attic. 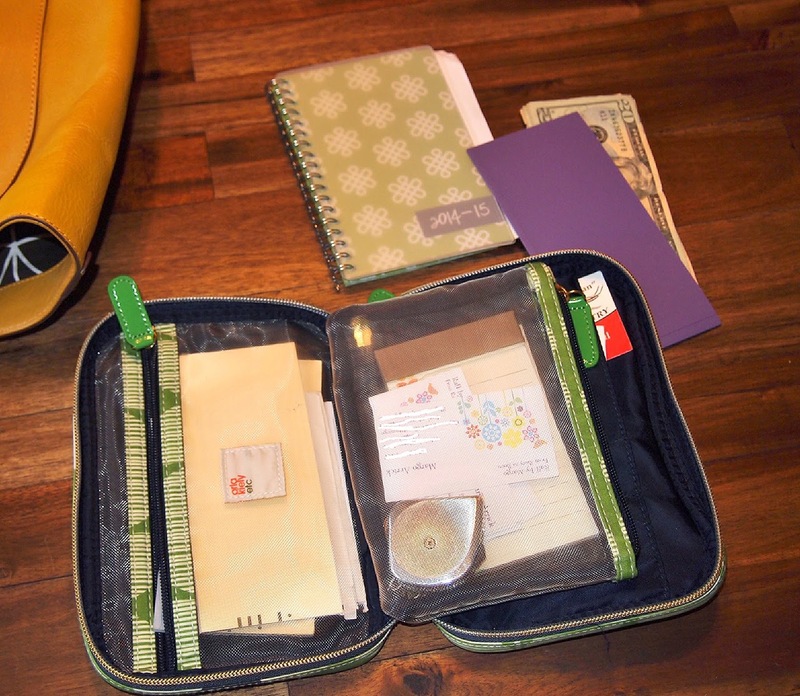 Some good products to help you get organized. 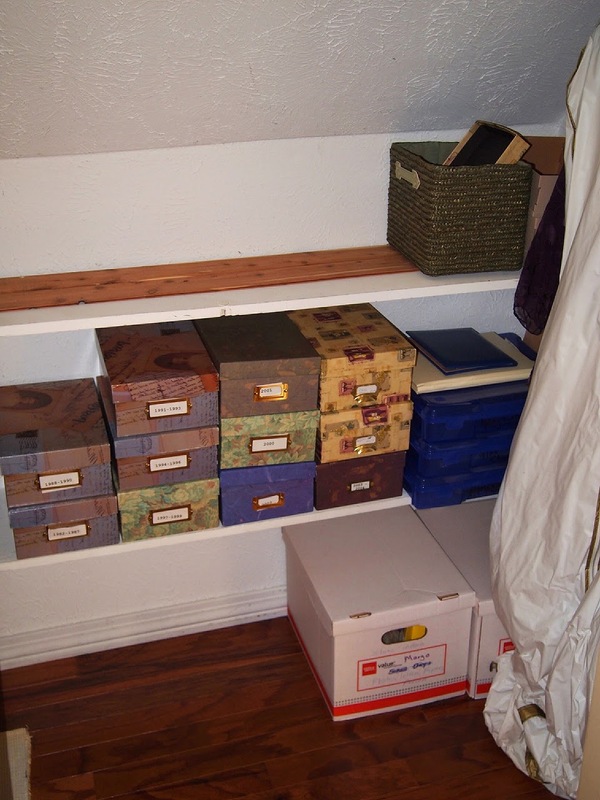 Lidded storage boxes (on floor) are an inexpensive staple for me. I use them at work, at home, in the garage, and barn etc. But remember to label them or you will not know what is inside. 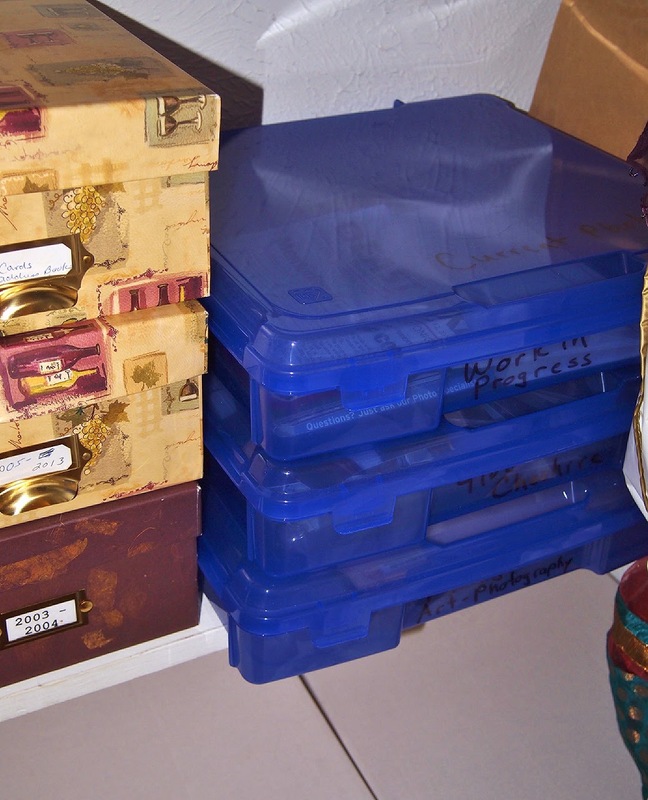 One of the favorite organizing tools that I found were these storage boxes from Michael's. I found them in the scrap-booking storage isle at 50% off. $15 for 4 boxes. I like these for several reasons. they will hold notebooks and newspapers where the shoe box sized boxes will not. and they stack very nicely. 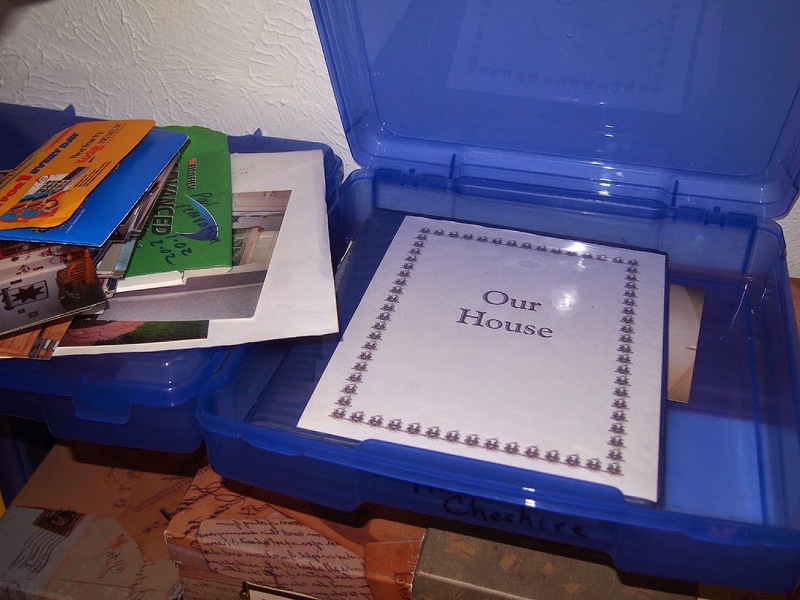 This one houses a scrapbook I made years ago and loose photos of our former home remodeling adventures. These are a few other products I picked up that I really like. The expandable folders are a bit less wonderful but are also less expensive and are perfect for certificates, documents, clippings etc. The zip folders expand and will lay flat inside a shoe box and are nice for bulkier items, like disks and cassette tapes. I had a lot of fun going through these old keepsakes, and getting them organized. I found an old audio tape my dad made of an interview and listened to the whole thing while I sorted. 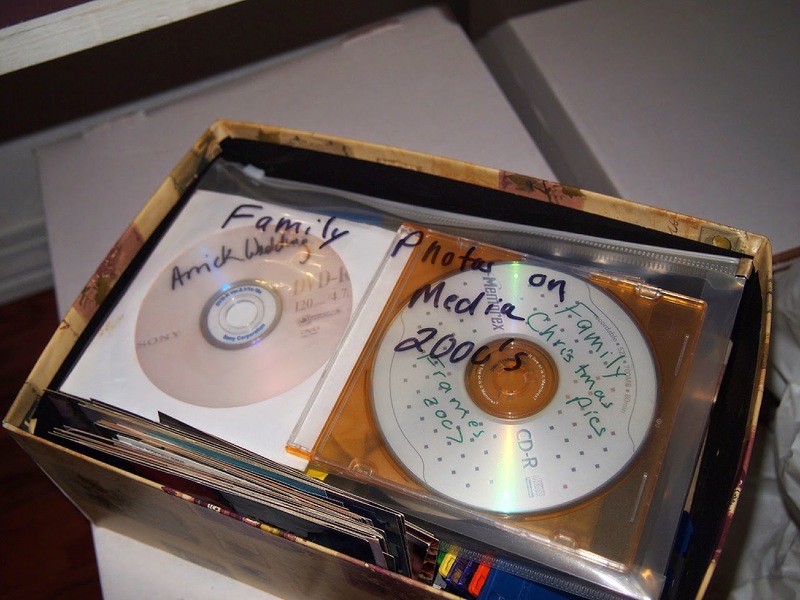 It was all very technical stuff, but is one of the only recordings I have of my Dad's voice. I will definitely store it indoors. I hope this will encourage you to get into that Memory stash you've been accumulating and get it sorted out. You'll be glad you did and you'll find lots of fun stuff. 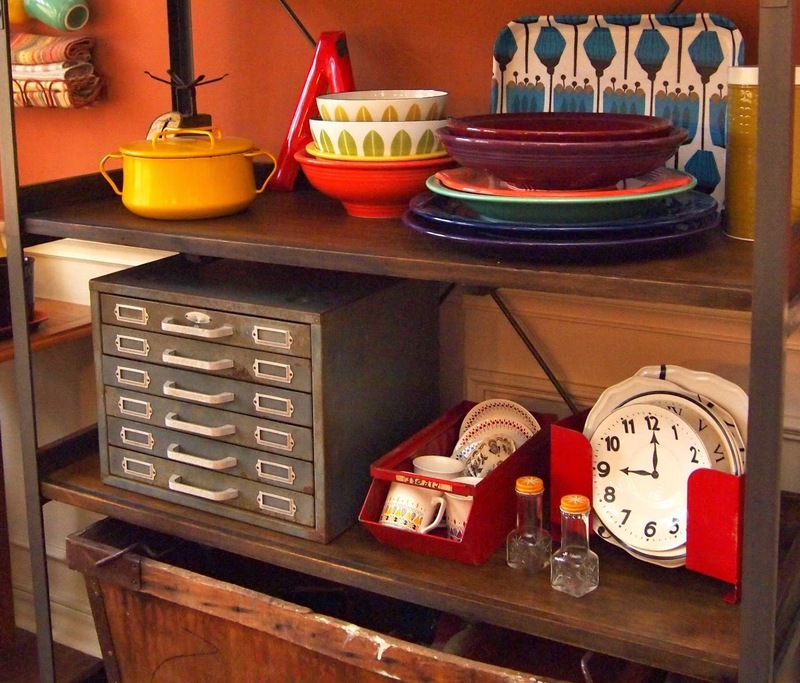 I love using Junk and found objects for storage and organization in my home. I use this set of drawers to store my good flatware, nice serving ware, and cloth napkins in my kitchen. 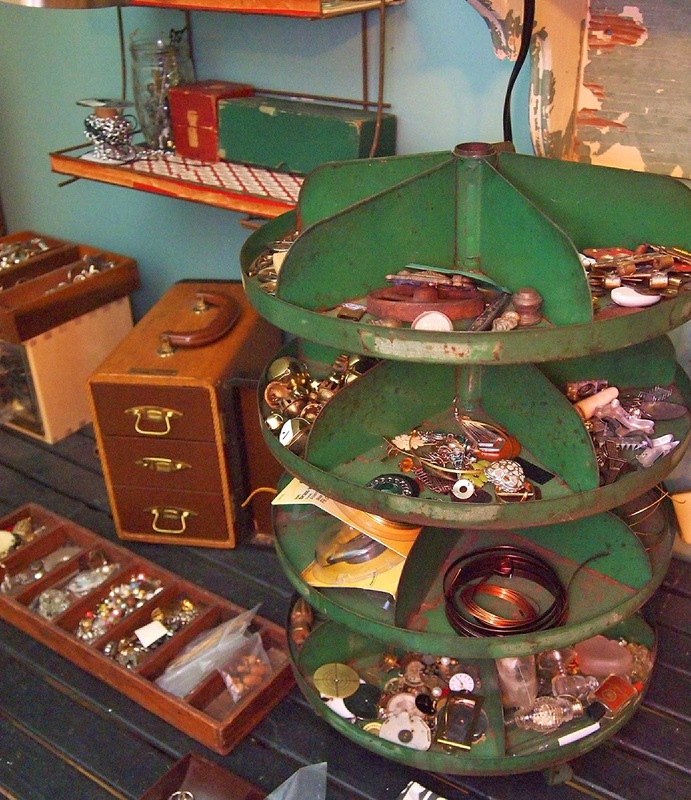 One of my favorite things is this old rotating bolt display bin from a hardware store. You can find a lot of fun junk items to help you with your storage and display needs in my etsy store. And I'm still de-stashing, so some of those goodies from the printer's type drawers may just end up in my etsy store too. Time to Tackle the Jewelry. 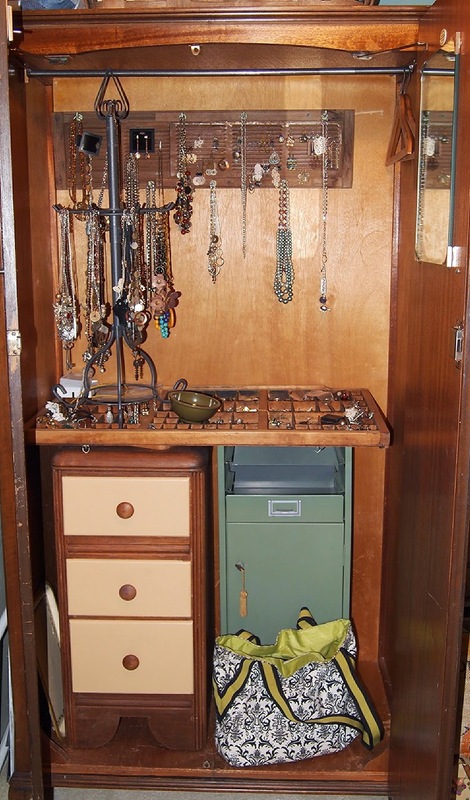 I have all my jewelry (not the valuable stuff) sorted on hanging hooks, and in an old type drawer tucked inside an old armoire. I propped the type tray up on a couple of old cabinets, but I realized the only reason I have the cabinets in there is to prop up that tray. The whole thing, although functional was getting pretty messy and not very nice looking. So I began to search for another way to store my jewelry, and found this. 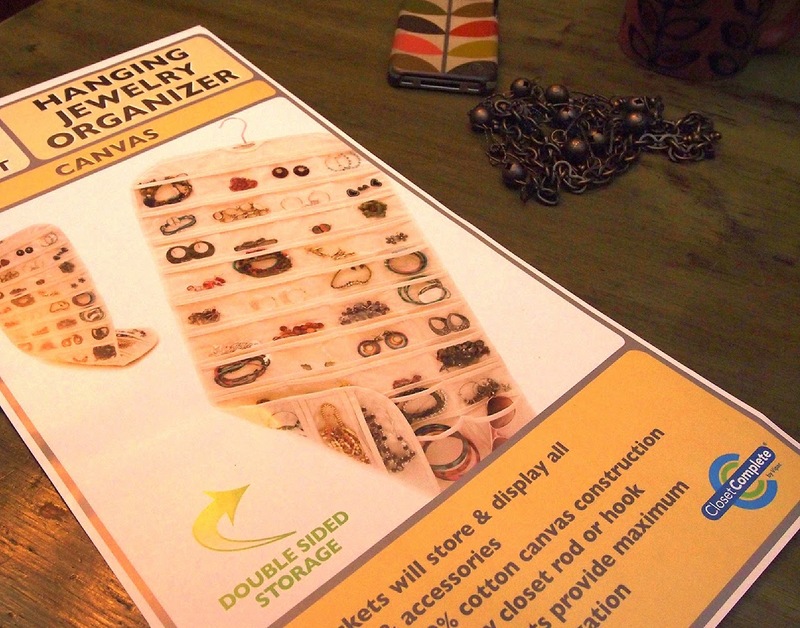 Now I'm not one to encourage people to go out and buy new stuff, but I could see that this hanging Jewelry Organizer, might just work for me. It was only $14 on Amazon.com and arrived today, so I got right to work. First I emptied the cabinet, I love a clean slate. 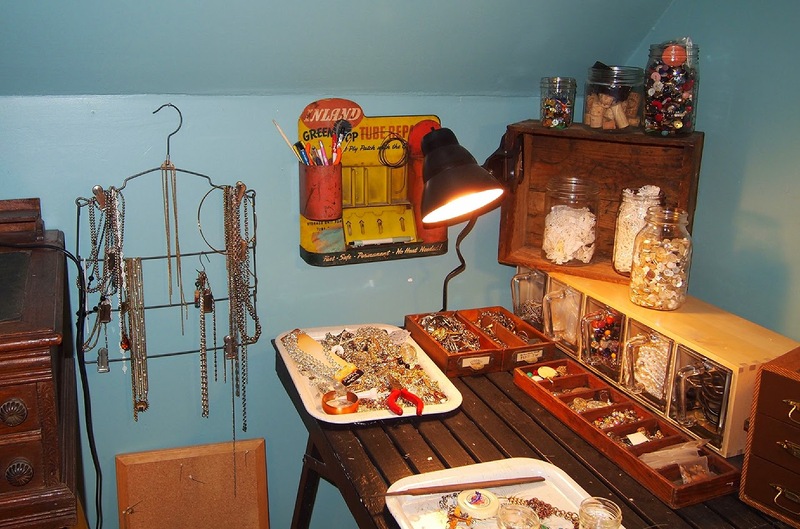 Then sorted all my earrings and such into the handy divided pockets of the organizer. I decided to regain some of the lower space for storage by keeping one of those cabinets. And I love how tidy it all looks now. And I sorted my earrings by color and style as best as I could and they are all easily visible, as well as other items like pendants, and bracelets. So this is one product I recommend if you think it might help with your jewelry sorting problems. 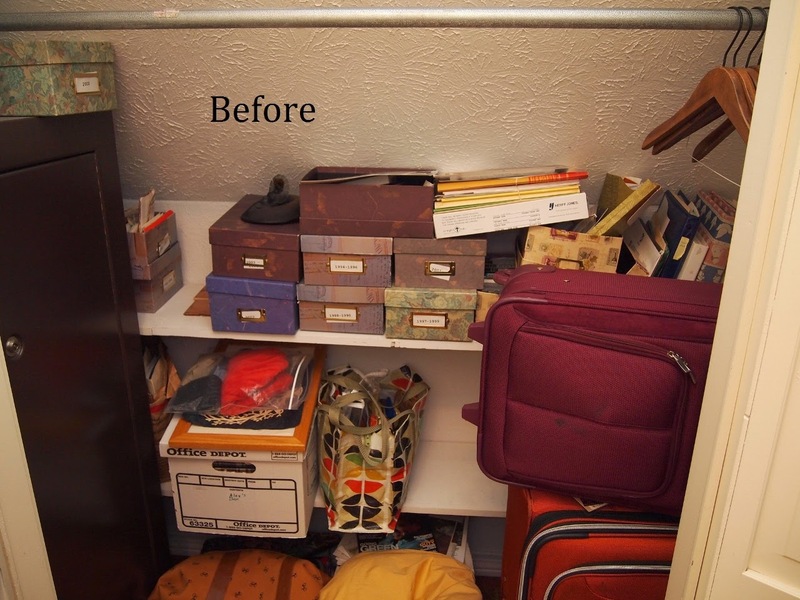 Getting Organized "The Great Purge"
I'm not one to usually make new years resolutions. Instead I try to embrace changes as they presnt themselves. So sometime back in December, I became overwhelmed with stuff. At that time I decided to do what I call "the Great Purge". I'm doing my whole house, a drawer, closet and room at a time, a little each day. I'm a pretty organized person by nature. And I have a firm belief that you either are or you are not, and it's very difficult to become permanently organized if you are not naturally organized. But I will tell you that if you will attempt to organize your life you will find that you have more time for the people you love and hobbies you love. So my problem was not organization as such, just that I was feeling overwhelmed by all my stuff. 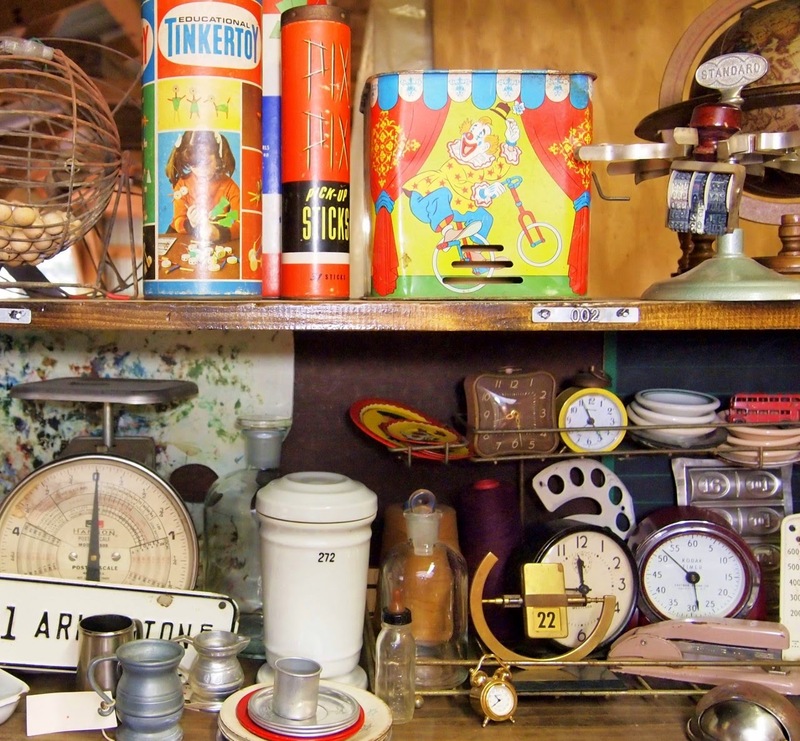 Part of the issue is that I have a business, and that business is to buy and sell great old stuff. And I have to keep that stuff somewhere until it sells. One of her tips is to group "like with like". Meaning as you are sorting group simliar stuff together, sort and eventually store these similar items together. 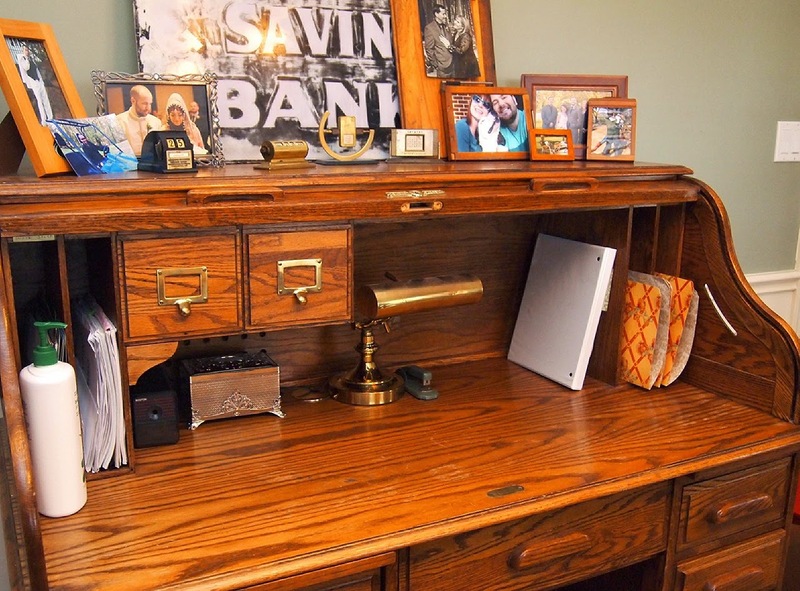 So last night I tackled one of my desks (I have 3) My roll top desk although outdated, is sure handy, and is where I keep most of my personal family business papers. I began to clean out the drawers and grouping "like with like" and I was overwhelmed by some of the numbers of my accumulations. 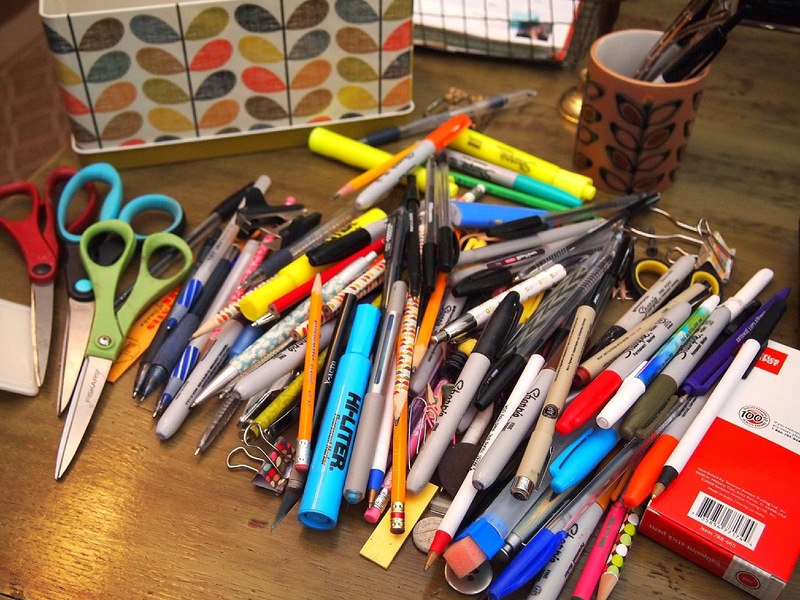 I mean how many pens does one person need? Some other things I found that I had too much of was greeting cards, and envelopes and note pads. I kept a reasonable amount of them and threw the rest away. Yay!!!!! 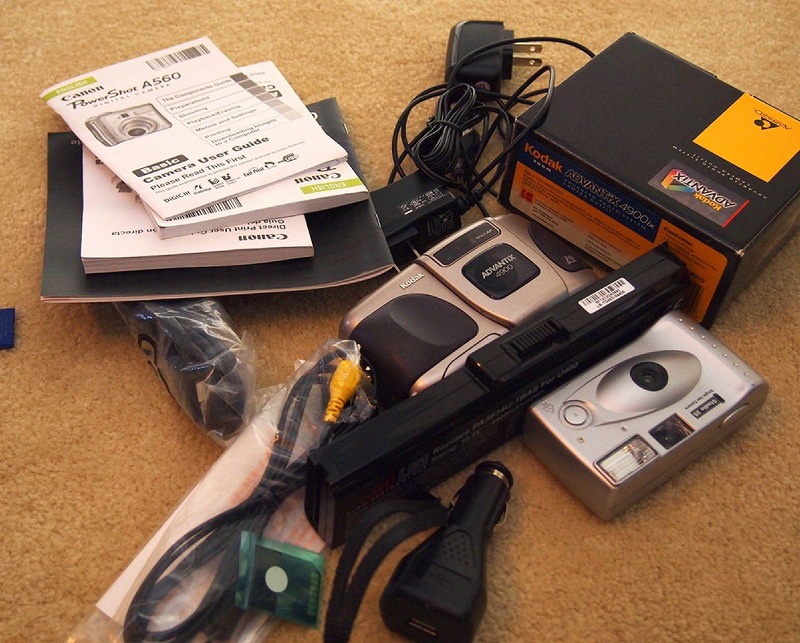 Another of her tips is to gather all broken electronics in one place and send it to best buy for recycling. This is what I've found so far. I have a husband who is hesitant to throw this stuff away so I'll be giving it to him to deal with. 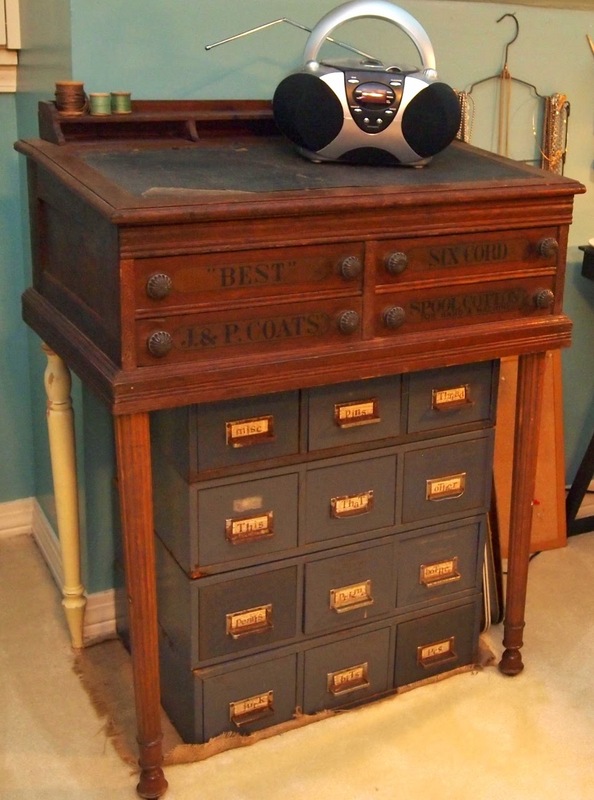 It will probably go into a box in our attic for just this type of thing, but It won't be my problem after that. And now for a shot of my desk after clean up. Wish I had taken a before. It feels great to start the year out like this. The Great purge continues and I'll be blogging about different things I'm doing to de-stash. 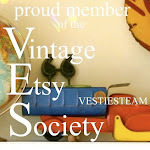 But the best news, is that many of my best treasures are being listed in my Etsy store all month. All new listings are from my personal collections, and I've kept the best for myself, so this is good stuff! 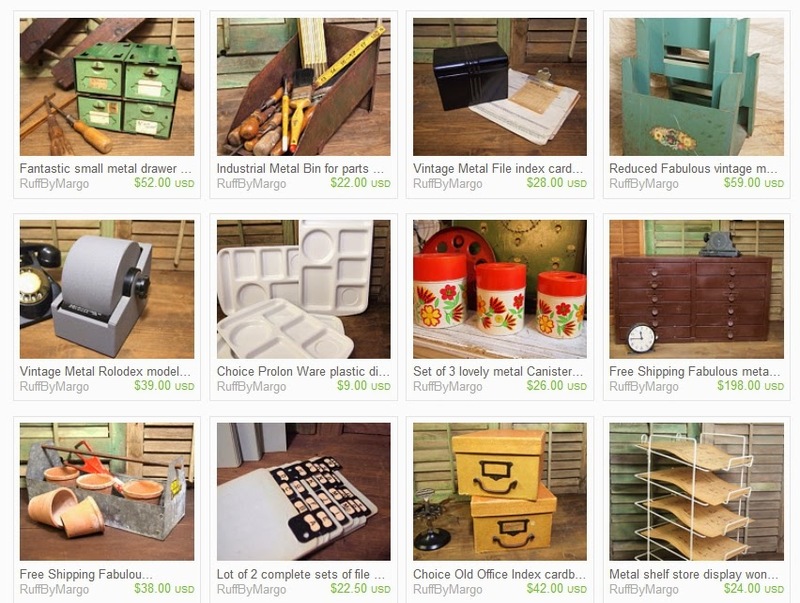 I also have a lot of fun items to help you get organized in vintage junking style so check out my Etsy store and type "Organize" in the search box.